Structure: double wall, with insulation, sandwich structure. 2.Double wall, thickness of outer plate: 1.5mm, thickness of inner plate: 0.8mm, with heat insulation between two walls. 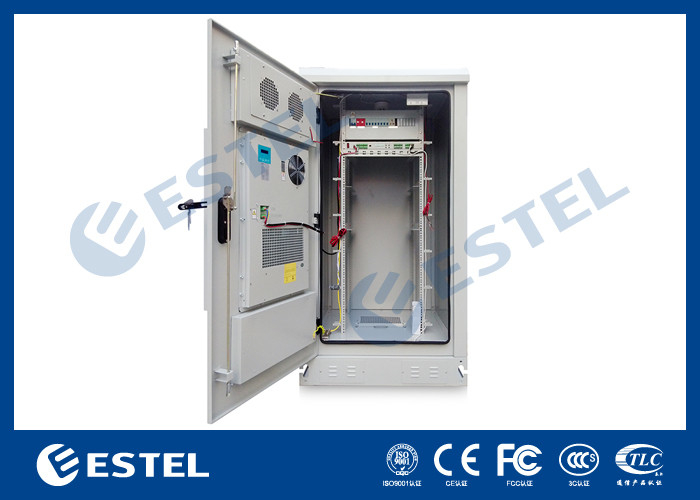 The Outdoor Telecom Cabinet is mainly used in communication base station, such as 4G system, communication/network integrated service, access/transmission switching station, emergency communication/transmission, etc. 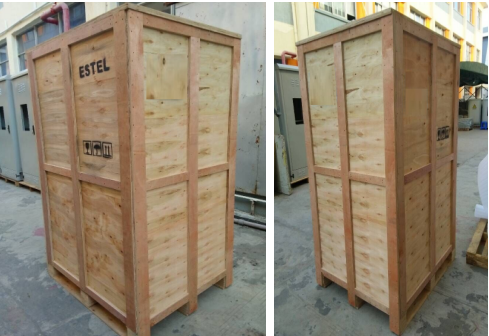 The cabinet is made of galvanized steel, with double walls, thickness of outer plate: 1.5mm, thickness of inner plate: 0.8mm. There are heat insulation between inner wall and outer wall. The insulation material is 40mm PEF. The cabinet is assembled type. The cabinet is equipment cabinet, including 19” equipment installation rack, with air conditioner on cabinet door. The cabinet door uses embedded structure. The door opening angle is larger than 110°and the door limit device can limit the opening angle. The lock is theftproof three point lock, supporting padlock. 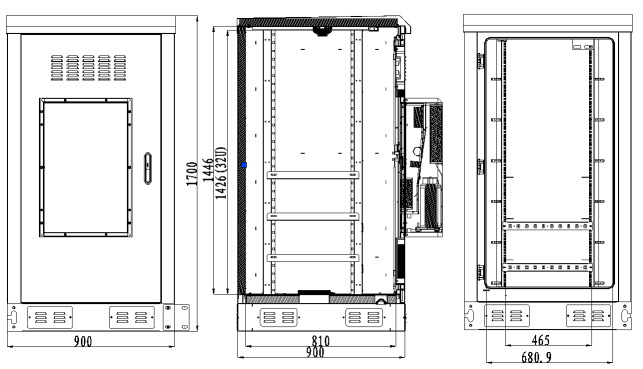 Each cabinet door include open door sensor, working together with the environment monitoring unit. 4.1 The cabinet is dustproof, sunproof and rainproof, which is used in outdoor environment. 4.2 The cabinet cooling uses air conditioner. 4.3 Including -48VDC illumination lamp. 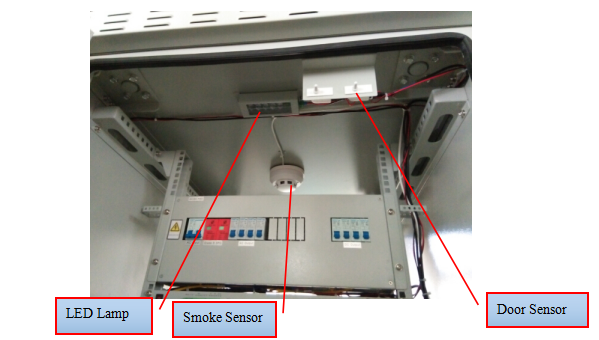 4.4 The cabinet includes power and environment monitoring unit, which can send power failure alarm, door open alarm, temperature and humidity alarm, smoke alarm, water alarm etc. 4.5 The layout of the cabinet is reasonable, which will facilitate cable access, fixing and grounding. 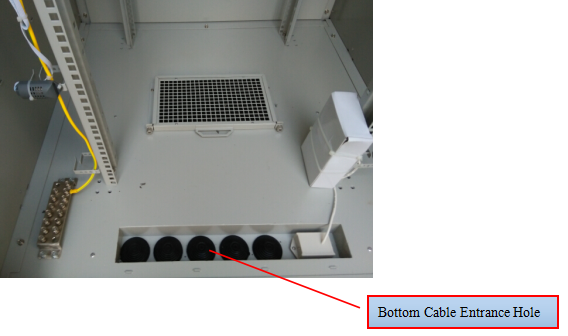 At the bottom of the cabinet, there are entrance holes individually for power cable, signal cable and optical cable. 4.6 All the cables, sealing and heat insulation used in the cabinet are made from flame retardant materials. 4.7 The cabinet uses assembled structure, easy for installation. 4.8 The cabinet includes 19” standard installation rack. Surface treatment: degreasing, derusting, rustproof phosphating (or galvanizing), powder coated. Insulation resistance: the insulation resistance between grounding devices and cabinet body parts is not lower than 2X104M/500V(DC). Withstand voltage: the withstand voltage between grounding devices and cabinet body parts is not lower than 3000V(DC)/1min. Mechanical strength: each surface can bear upright pressure＞980N; after the door is open, its outer end can bear upright pressure ＞200N. 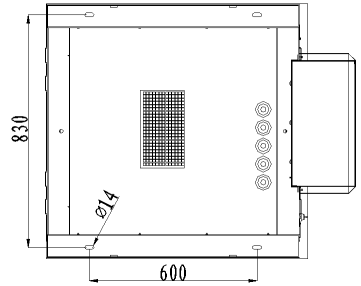 Cabinet External Dimension (W×D×H): 900×900×1700mm. 6.1 LED lamp, smoke sensor and door sensor are installed at the top of the cabinet. 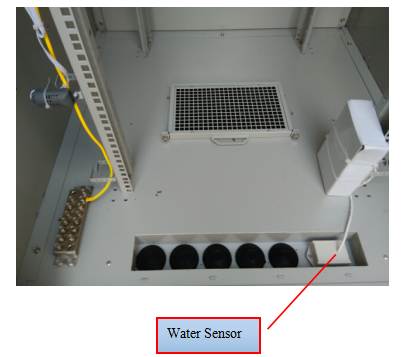 6.2 Water sensor is installed at the bottom of the cabinet. 6.3 Temperature and humidity sensor is installed at the side inside the cabinet. 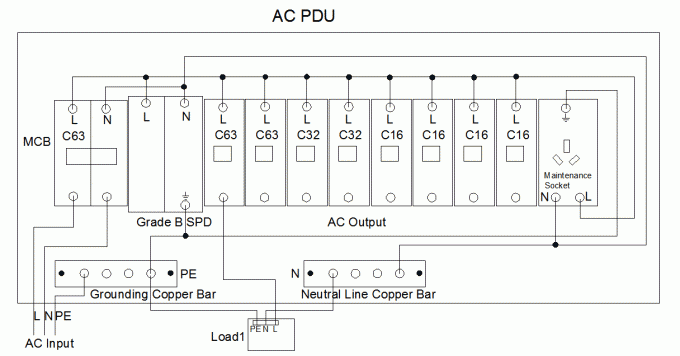 Feeder cable and other external cables all use bottom wiring method. The cabinet includes grounding copper bar with anti-corrosion coating. There are enough screws for wiring connection terminals. The metal part of the cabinet should be interconnected and be connected with grounding bar. Connection resistance between any two points is lower than 0.1Ω. Protective earthing of other equipments inside the cabinet should be connected to the grounding bar. 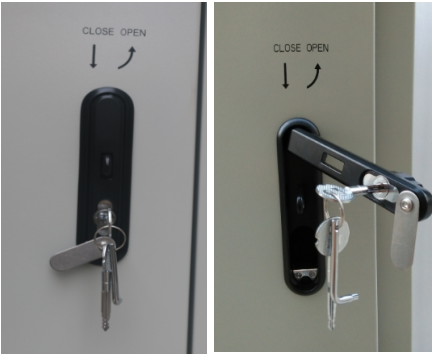 Damage resistance of the theft proof lock meets GA/T 73-1994 “Mechanical Anti-theft Lock” class B requirement, supporting padlock. Use anti-loose threaded connection as structure and bearer connection. Anchor bolt for fixing cabinet use hot dip galvanized bolts. 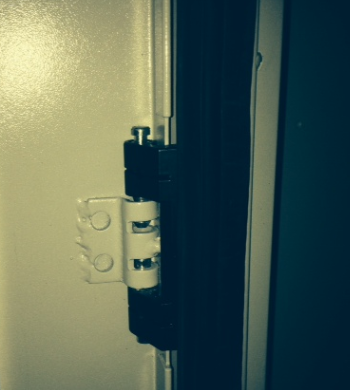 Door hinges use inner hinge mode. Cabinet surface coating is outdoor special powder coating, with white gray color (PANTONE 428C). The coating complies with GB/T 3181-2008 requirement. 10.1 Users prefabricate concrete base. 10.2 Pre-embed 4pcs M10×120 anchor bolts on the concrete base. Distance between bolts are as that in diagram 1. Bolt exposed height is 40mm. Put the cabinet on the concrete base, align anchor bolts, then screw on nuts, and tighten them with wrench. 10.3 According to site situation, put the cabinet on the concrete base with forklift, crane or manually, and fix it on the concrete base with bolts. The goods can be shipped by sea, by air, by courier, by land, by train, etc. Besides the following delivery agent, we can also look for the delivery agent with the best price in china if you need us to do for you.